Threshing station uses strong vibration to make separation of palm fruit from palm bunches. Raw materials after sterilization are sent to bucket elevator through damp car, and elevated into threshing machine. 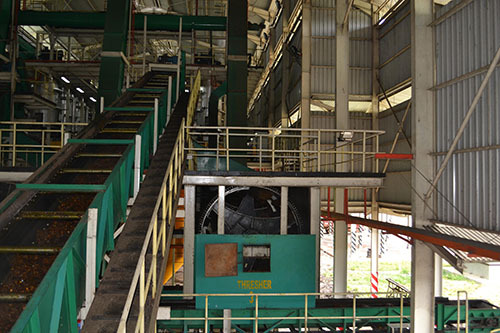 Palm fruit separates from bunches, sent to next section elevator through screw conveyor. Empty bunches through conveyor and charger, are transported to certain place for further treatment by car. Palm fruit threshing station can vibrate palm fruit from palm bunches efficiently. It makes further preparation for next step palm fruit oil press processing.